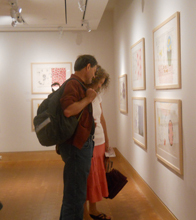 Self-guided groups will be met by a Museum educator and given a brief orientation, followed by an opportunity to visit the Museum’s Galleries, Art Studio, and Reading Library. We encourage those organizing a self-guided program to be familiar enough with the Museum to provide a context for the visit. After reading the information below, please complete our online Self-Guided Group Inquiry to request the right Group Tour for you. Reservations are required and need to be made at least three weeks in advance. All cancellations require two weeks’ notice. You can prepare for your visit by reviewing the Self-Guided Program Checklist (PDF) and selecting pre-visit and post-visit activities from our Resources for Visiting Groups. Large youth Self-Guided Groups will be asked to travel in 3 rotating groups due to space limitations. Adult Self-Guided groups may be asked to explore the Museum in small groups. Chaperones are admitted free of charge and must remain with their group at all times. For all student tours we allow 1 chaperone for every 4 students. Additional Adults will be charged the regular Museum Admission fee. Museum Memberships and passes do not apply. A Free Access Program is available for eligible 501(c)3 organizations that serve low-income and/or at-risk children and their families. We do not have a full service café at the Museum. On a space-available basis Guided Programs are invited to eat their own lunches in the Café. Reservations must be made in advance. Weather permitting, the Courtyard is available for picnics free of charge.